A solid defensive back during his time with the Giants, Kinard would have 3 picks his rookie season. In 1985 he’d have a career high 5 interceptions for 100 yards and a fumble recovery. He’d tie these numbers again 2 more times during his career, -in 1987 when he had 5 picks for 163 yards and a td, and in 1989 when he lodged 5 picks for 135 yards and a td as well. 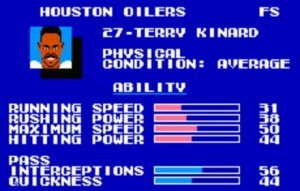 Over his time with New York, Kinard would start 99 games and make 27 interceptions and play in one Pro Bowl (1988). 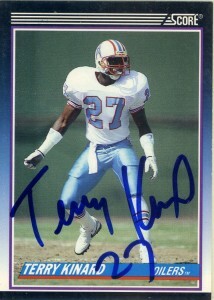 In his final season, Terry would sign with the Houston Oilers via Plan B. Kinard in his final season would have 4 interceptions for 75 yards and a fumble recovery for a 75 yard touchdown. Named to Clemson’s Centennial team in 1996, the #3 player in Clemson’s history, Clemson’s HoF in 1992, and Sports Illustrated’s College Football Centennial Team in 1999. Terry Kinard was also inducted into the College Football HoF in 2001 and the South Carolina HoF in 2002.